To determine the pharmacokinetic properties of dihydroartemisinin (DHA) following oral artesunate treatment in women with recrudescent multi-drug resistant falciparum malaria, in the second and third trimesters of pregnancy. 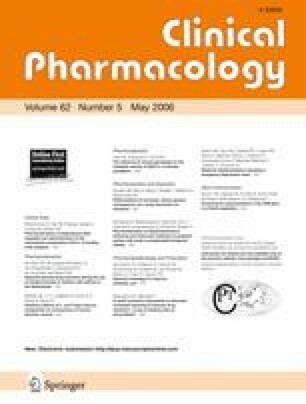 Serial plasma concentrations of artesunate and DHA were measured in 24 women after the final dose of a 3 day treatment with artesunate (4 mg kg−1 day−1) and atovaquone (20 mg kg−1 day−1) plus proguanil (8 mg kg−1 day−1), daily. Conventional non-compartmental modelling and a population one-compartment pharmacokinetic model were applied to the data. Artesunate was very rapidly eliminated. For DHA the median [90% range] estimate of oral clearance (CI/F) was 4.0 [0.8–20.7] l hour−1 kg−1, total apparent volume of distribution (Vd/f) was 3.4 [0.9–60.7] l/kg, and terminal elimination half-life was 1.0 [0.6–2.4] h.
The kinetics of DHA are modified by pregnancy. The plasma levels of the active antimalarial metabolite DHA are lower than reported previously in non-pregnant adults. Dose-optimisation studies in pregnant women are needed. We thank the pregnant women who participated in the study, the staff of the Shoklo Malaria Research Unit in-patient department and antenatal clinics for their help. We are grateful to P. Newton for his comments on the manuscript. Drug analyses were performed through the Wellcome Trust funded LOTLink initiative. This investigation was part of the Wellcome Trust Mahidol University Oxford Tropical Medicine Research Programme supported by the Wellcome Trust of Great Britain.